I previously mentioned that I read the Compound Effect as my summer read this summer. I really feel like this book gives more insight to our 'instant gratification' / 'gotta have it now' society. 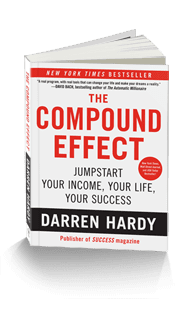 Darren Hardy reiterates that making small changes over time will "compound" and have a good / bad effect on every facet of your life. I really think that if more people took the slow & steady mindset, and made small changes to their daily life they would be FAR MORE likely to stick with a healthy lifestyle. Think about it, how many times have you started a new workout or new diet and gave up after a week, 2 weeks, or a month? Why did you give up? Were the results not coming quick enough? Here's the thing....time is not going to stop for you. If a year is going to pass, why not keep working at a goal for a year & then see where you stand? If you want to get those rock hard abs, it's not going to happen in a week! I love following the body building competitors online. They constantly post "transformation" pictures, and never once has the caption read "after 1 week I went from flab to abs!". No it's been months & months on end. So here's my challenge to you: find one thing about your daily routine that you can tweak to produce positive change a year from now. Don't set yourself up for failure! Don't say "I'm going to cut out ALL CARBS". That is RHONJ crazy! Your body will end up craving carbs and the moment you indulge and eat bread, you'll get depressed & totally abandon your new "diet". Rather than abandoning a necessary fuel source (carbohydrates), why not take out from your daily routine, that brownie after lunch, or that bowl of cereal at 8pm? It's small changes like that, that will produce long term changes. More on this to come because I am on SUCH a high right now :) and a soap box apparently!